It was revealed on Tuesday that Apple has changed the terms and conditions tied to AppleCare+ and will be lifting geographic limitations on support, meaning travelers can get their device serviced outside of their home country. As noted by TechCrunch, the recent policy change allows owners to take in products for repair in any country where AppleCare+ is offered, lifting previous restrictions that limited service to the country in which the plan was purchased. Devices include the iPhone, iPad, iPod, Apple TV, Apple displays and Mac models. It should be noted that replacements and repairs may not be offered in all countries. The publication offers the CDMA version of the iPhone 5 as an example, pointing out the handset can't be serviced or replaced in countries where it is not sold, like Brazil. In a related development, blogger Sonny Dickson posted two documents pertaining to the upcoming AppleCare+ changes to Twitter. 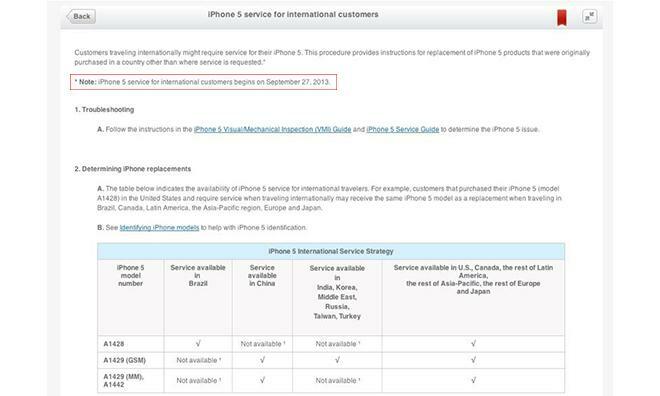 One of the "leaked" pages, seen above, notes that international servicing for the iPhone 5 will begin on Friday. The changes are likely part of Apple's continued effort to overhaul its post-sales service. When the iPhone 5s and 5c were unveiled on Sept. 10, it was announced that the AppleCare+ for iPhone per-incident deductible would be raised to $79, up from $49 previously. Currently, AppleCare+ for iPhone, iPad and iPod is offered in Austria, Canada, China, France, Germany, Hong Kong, Ireland, Italy, Japan, Netherlands, Singapore, Spain, Switzerland, the UK and the US.